Kiwicare and New Zealand Gardener Magazine are seeking nominations for Gardener of the Year. This year the winning gardener will receive a years supply of Kiwicare Garden products and prizes total $20,000 including regional winners. This year there will also be prizes for the best school vege garden and the best community garden. Each will win $1000 for Kiwicare garden products and $1000 of Mitre10 vouchers. If you know someone that is deserving of this award send a letter to NZ Gardener to nominate the most passionate gardener in your region; or a local school or community garden. Detail why they'd make a worthy winner and don't forget to include your name and phone number, plus contact details for the person you've nominated, or someone involved with the school garden or community plot. Entries close on 12 September 2011. If I could only grow green stuff in my garden like I can in my refrigerator. Last night TVNZ1 began showing a series of programs named Infested. The program aired at 9.30pm and last night's episode featured infestations of rats and bed bugs. The family suffering from bed bugs were getting bites which were initially diagnosed by a doctor as an allergic reaction to something in their environment such as a change of washing powder. 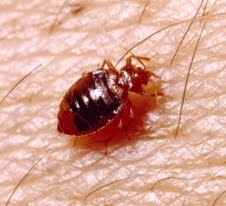 It was only when the lady of the house investigated and found bed bugs crawling on her children's beds at night that the culprit was identified as bed bugs. This highlighted the difficulty in identifying bed bug infestations just from their bites and how difficult they are to find as they only emerge from their hiding places at night. I suspect a large number of people watching the program suddenly realised that the itchy marks they had been getting recently may be caused by bed bugs. The Kiwicare website got a sudden influx of visitors between 9.30 and 11.00pm last night. Nearly a hundred people in New Zealand visited the site in this period seeking information on bed bugs and how to get rid of bed bugs using the Kiwicare Bed Bugs Box. Next week's episode of Infested will "....﻿reveal the pain and anguish of living with shocking infestations of [some] cockroaches, rats, bedbugs, scorpions, ants, raccoons, mice, snakes and spiders." Have you heard about the pregnant bed bug? She gave birth in the spring. With snow falling around me I was on my way to Christchurch Airport early yesterday morning. When I heard on the radio the airport was closed I checked and found that my flight and all those in the morning were cancelled. I re-booked for an evening flight and was confident that the runway would be cleared by then. False confidence as it turned out. I have had to cancel my trip to Auckland to attend the Bunnings Expo where I was to be the 'expert' for pest control questions. 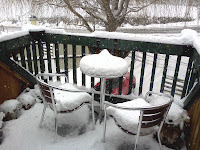 I am sure that Kiwicare Sales Manager Neil Martin and garden expert Ben Adams will be able to hold the fort. 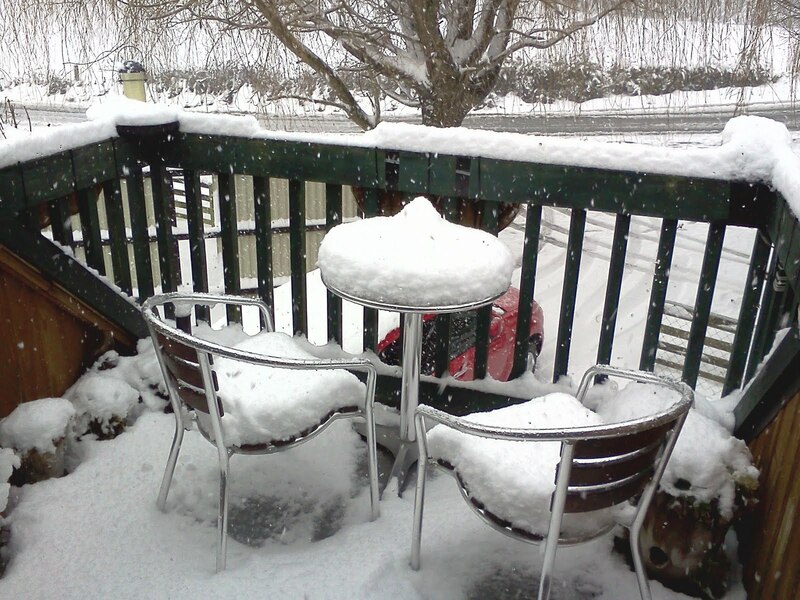 Working from home yesterday I watched the snow continue to fall and considered what such a widespread cold snap might mean for pest issues around New Zealand. Cold is the enemy of insects and small mammals. The smaller a creature the more affected by temperature they tend to be. Insects may be able to survive cold conditions by being in a state similar to 'hibernation.' Their metabolisms are slowed and energy reserved. Small mammals will seek shelter and use energy reserves to keep their bodies at a temperature that will sustain their lives. If they have sufficient reserves built up through plentiful times in autumn they will survive, if not, they die. Some insects are adapted to survive freezing for short periods, but few can survive for extended periods. Some insects survive as grubs or adults deep in the soil where they are less affected by cold. Short cold snaps of a few days will not penetrate more than a few inches into the soil. Those insects or small mammals such as rats and mice that take refuge in heated homes can survive easily through the coldest periods. Not only are they protected from severe temperatures but they often find access to food supplies that sustain through the winter. In consequence the short cold snap and snow will reduce both insect and rodent numbers in the wild, it will drive more to seek refuge in homes and other buildings, but it will not affect better adapted insects such as grass grub or sheltering pests such as cluster flies or rodents that enter our buildings. 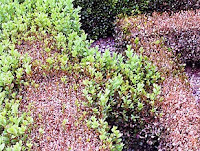 Plants of the genus Buxus (aka Box or Boxwood), which are often used for hedging and topiary, are being affected by a fungal disease caused by Cylidrocladium buxicola. It is thought it originated in Central America but C. boxicola was isolated from buxus hedging in the UK in the 1990s and has since spread to Europe and New Zealand. It causes dieback in the buxus, leaf drop and death in affected plants. Early detection is vital. The initial infection is characterised by general darkening of the leaves, spreading in a circular fashion across the whole leaf. The infection then spreads to the stem below and the leaves die, turning light brown and falling off. Complicating diagnosis, other die-back diseases, such as that caused by Phytopthera, cause similar symptoms, so it is not always easy to identify which disease is the cause. When affected, the buxus plants may also be susceptible to other infections such as mildew like fungi. A recent study by Henricot et. al. of the Royal Horticultural Society, studied the control of C. buxicola using fungicides. This study found that among the fungicides tested carbendazim was effective at reducing and stopping growth of the fungus mycelium and mancozeb was effective at inhibiting the germination of spores. Kiwicare Super Spectrum (previously known as NO Insects or Disease Spectrum powder) contains a combination of these fungicides and is likely to provide some curative and preventative effect. Although Henricot et al suggests they found little effect from copper spray I have had personal communication from professional landscape gardeners in New Zealand that they have used Kiwicare Root Protect Aliette with success, and Copper Oxy as a preventative, and it has worked to stop spread of disease when the disease has been identified soon enough. See here. There are fewer options available to the home gardener in the UK than there are in New Zealand. So references that cite that 'there are no effective fungicides available for control of Box Blight' are referring to Europe not NZ. Improving air flow around the plants to reduce infection from wind borne spores. Cutting out and destroying dead or affected material. Proactively clearing up and destroying dead leaves and dead material from around the plants as the spores can remain viable in the leaves for some years. It would also be advisable to sterilise clipping and cutting implements when trimming buxus so as not to spread the disease. Other dieback diseases of buxus such as Phytopthera can be treated with the fungicide NO Root Rot Aliette. Phytopthera are root diseases and it is advised that roots as well as the upper parts of the plants are treated. Gardening requires a lot of water - most of it in the form of perspiration. This may not be a silver lining, but perhaps I would refer to it as a 'bronze lining' for quake damaged home owners in Canterbury. Recently I have had several enquiries about borer treatment from people in Christchurch. With so many homes damaged and in the process of being repaired, many are cottoning on to the fact that this provides an opportunity to protect timbers from borer. This is the ideal time to treat the wood with Borer Fluid. NO Borer fluids get deep into the timber and both kill borer larvae present in the wood and protect the timber for many years. Often it can be difficult to treat wooden homes and homes with wood for borer. Treatment is often limited to slowing the damage with the use of Borafume and Bug Bomb fumigators because treatment of bare timber is not possible; it is normally hard to get at the interior of walls and the sub-floor of many houses. But, when repairs are being carried out, the timbers may be exposed. Interior surfaces of weatherboards and structural timbers in the walls can be attacked much more heavily than is evident from the painted exteriors. In general there are 10 times as many flight holes inside the wall as on the exterior. Similarly the underside of floor boards are more heavily damaged. When repairs are being carried out and these, usually hidden, surfaces are exposed it is the time to treat them. Why put your home back together without protecting it from insect damage? At the first modern Olympic Games in Athens in 1896, silver medals were awarded to the winners and bronze for second place. New Zealand's largest group of hardware stores, Mitre10, had their award dinner last night. Kiwicare were holders of the coveted Platinum Supplier of the Year having picked up the award for 2010. It was not expected that Kiwicare would win again following disruption from three major earthquakes centred near the head offices and factory during the year. But it was hoped that we would be able to sustain our long run of being in the top 10. It was therefore with delight that we found we were in the top 3. This is a great result and reflects the hard work of all the Kiwicare team over the last year; production, administration and sales. It is particularly satisfying to be in the top 3 for this award because it is the staff in the Mitre10 group stores that vote on a wide range of criteria; innovation, service, training, quality and sales. A hippopotamus walks into a bar and asks for a beer. "That'll be $15 please" says the barman. "We don't get many hippos in here." "At $15 a beer, I'm not surprised!" says the hippo. It is Biosecurity Month and here at Kiwicare our ever vigilant staff noticed an unusual spider wandering across the factory floor. 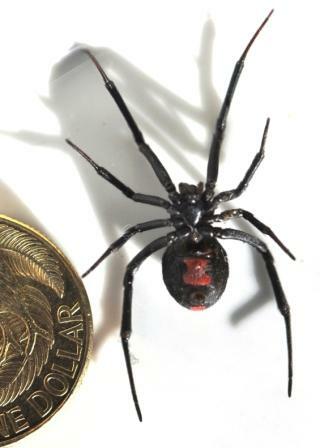 On identification it was found to be a female Australian Redback. This spider has a powerful venom and bite and has been known to cause death in rare occasions so we took care when collecting it and preserving it in 70% ethanol for id and reporting to MAF Biosecurity. The Redback can be easily identified by the red marking on the back and a red hourglass shape on the underside of the abdomen. 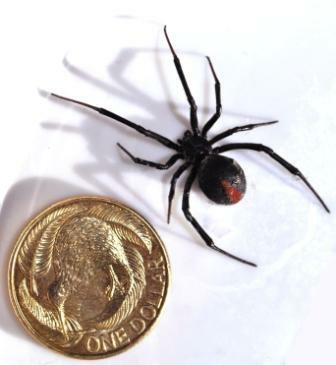 Redbacks originated in Australia and are a cousin of the native Katipo. They have been spreading across New Zealand and are found as far afield as Otago and Bay of Plenty. I am not sure how common they are in Christchurch, it may be that this one hitched a lift on a container that recently passed through the facility. What kind of doctors are like spiders? Get ready for a month of biosecurity-related stories plastering the media. Biosecurity is vital for New Zealand – so let’s encourage people to know more and be involved. Vice-President Pedro Jensen is again co-ordinating the NZBI Biosecurity Month activities. As we did last year we will aim to co-ordinate and highlight biosecurity stories from around the country. Contact Pedro Jensen (Pedro.Jensen@gw.govt.nz) for the NZBI Biosecurity Month email banner you can use in your emails. The design element can also be used as a temporary linked widget like the one below from your organisation’s website to our website. Click on the widgets above to learn more about Biosecurity Month. How many Kiwis does it take to eat a possum? Two. One to eat, and one to watch out for traffic.